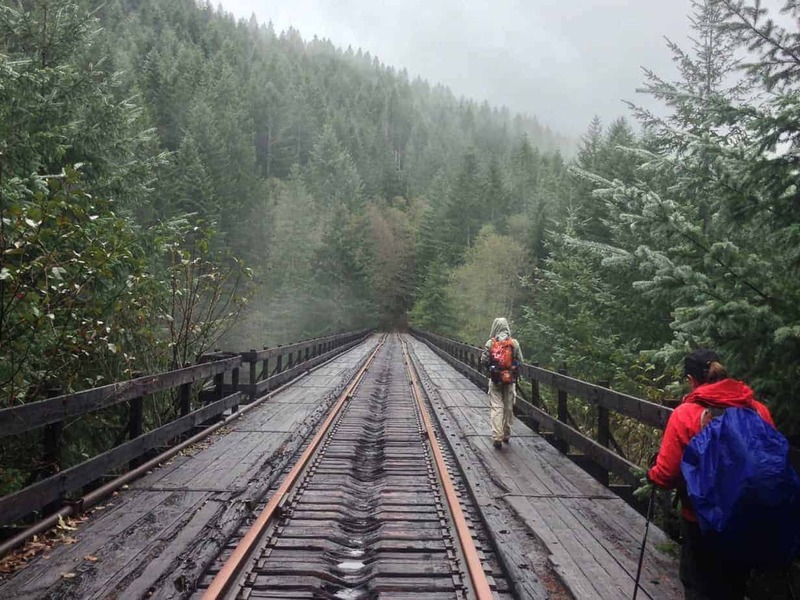 You will walk along many railroad ties that do not have any dirt right below them and across a 105 year old bridge (Big Ben Bridge) that is maybe a hundred feet over the forest floor. I did feel safe along the trail, but if you aren’t comfortable with heights, this may not be the best hike for you. Most of the hike is shaded which kept the things nice and cool! I think a rainy day would make this hike pretty stressful because it would be easy to slip on the railroad ties. Trailhead: https://goo.gl/maps/69Sa32R4Dm42 The road to get to the trailhead was pretty good, you’ll drive on gravel and dirt roads (so a car with low clearance isn’t ideal but a car with higher clearance is fine) but we had no troubles with our car/SUV combo. We went at the end of June so the wildflowers were lovely. You really only see 2 photos of the trail in most blog posts: Big Ben Bridge & Wolf Creek Bridge but there’s much more than just that! There’s tunnels, foliage & obviously overgrown railroads. Family Friendly? Some blog posts I read say this is a family friendly hike, but my parent’s assessment was only if your children are like 11+ years old. History! 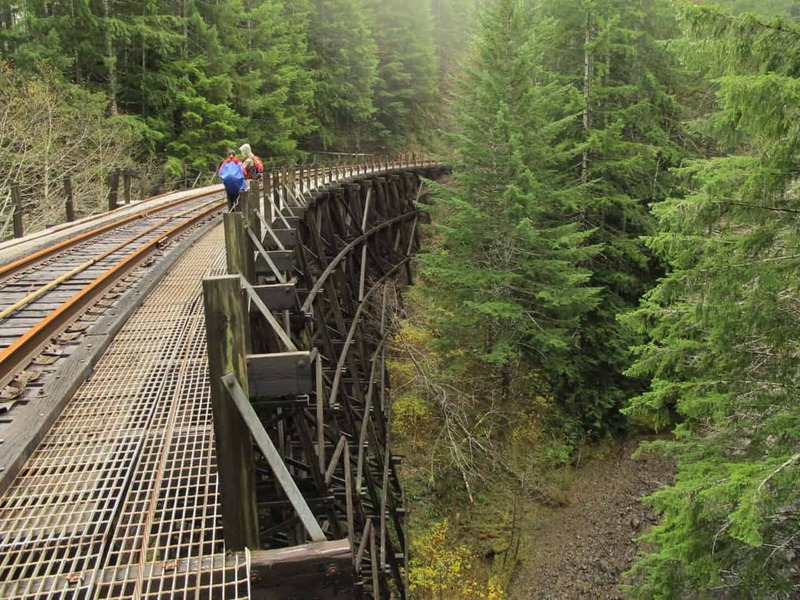 The Salmonberry Trail is a really neat rails to trails initiative that came about after a bad storm in 2007 that rendered the rails unable to be restored for train use. BUT is has paved the way for this great trail system! This trail is not currently maintained, so you need to be careful in some sections. There’s an initiative to make this a maintained trail from Banks to the coast which would awesome! The whole trail could also be washed away forever in another bad storm next year which is why I felt the urgency to check it out on my last trip to Oregon. The hike is remote with no services and stunningly beautiful! Also, this is the post I thought was most helpful in preparing for this hike. Its 3 years which is why I thought it needed a little updating, but its still a very good resource. Its up East Canyon; there’s a parking lot where Salt Lake & Morgan Counties meet. Cross the street (there’s trailheads on the parking lot side of the street as well). We followed the actual trail until the couple hundred meters, you can kind of see it in the route linked. The trail bends to the left around the mountain and a double track (that runs parallel for a couple meters) summits the mountain. We jumped on the double track and sumitted, but you can keep on the trail and see where it goes! This just took the crown as my favorite hike in Utah. With most hikes you walk through a forest and have an incredible view at the top. In THIS hike though, the parking lot has an incredible view and it just keeps getting better the whole time! The wildflowers were unreal (we went early July), there were lots of butterflies (and tons butterflies in training crawling on the trails), aspen groves and stunning mountain range views. It was awe inspiring. I really want to repeat this hike in October when leaves are changing colors. Family Friendly? The first half mile is aerobically tough (especially if you aren’t used to the altitude), but the rest of the hike is very family friendly, no scary drop offs. Notes: BRING BUG SPRAY. Mosquitoes ate me alive and the flies were pretty annoying. The trail does not end where we turned around, I believe it goes all the way to Canada, but at 19 miles you meet a road in Bountiful (I just followed the trail in Google Maps and am super intrigued). I live near the University of Utah, so we took the longer scenic drive through Emigration Canyon and it was only a 30 minute drive to the trailhead, highly recommended if you are coming from Salt Lake City. We went over the fourth of July weekend and even then only saw 3 others on the trail, so that combined with the views would make this a good candidate for an engagement hike.